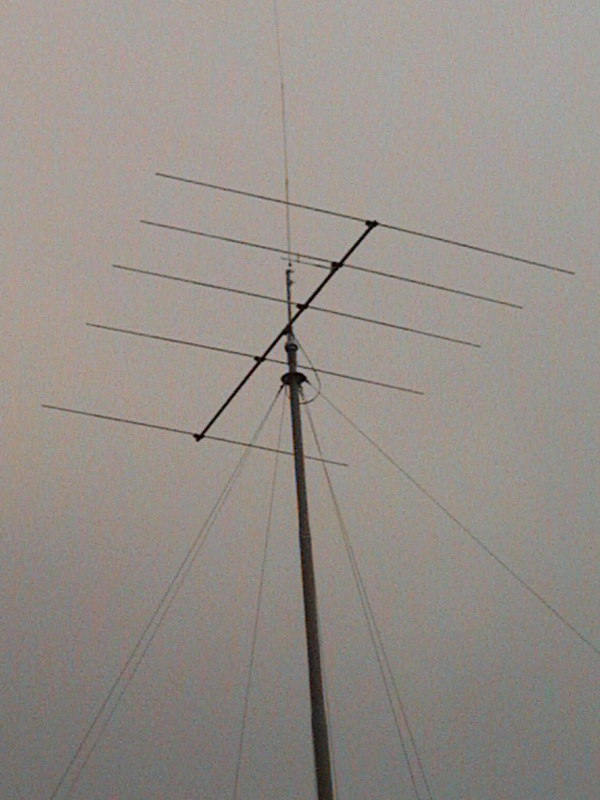 The yagi antenna is the most commonly used among the Beam variety. It's inventor was mr Uda Yagi and there it has got it's name from. The antenna exists of elements on a boom mostly from aluminum, though i have seen copper ones aswell. 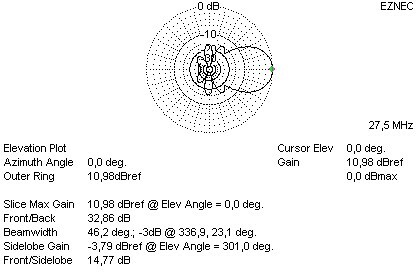 All the individual lengths are of influence of the antenna...this includes element thickness This also counts for the height you have located the antenna above your roof. 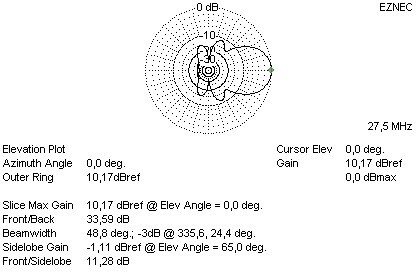 Above is a simple drawing of a 3 elements yagi looking from the top at it. The Red line is called the BOOM the black lines are called: ELEMENTS. The longest elements is called a REFLECTOR. 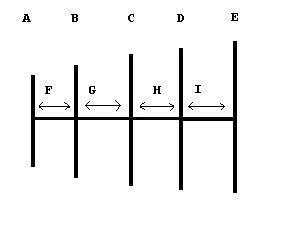 This side is often called the "Back of the Antenna" and although it does "reflect" the signals coming from the back of the antenna it also has a function in the Gain. The second from the back is the RADIATING element (the dipool) and is always shorter than a reflector and longer than a director. This is where your coax cable is connected. 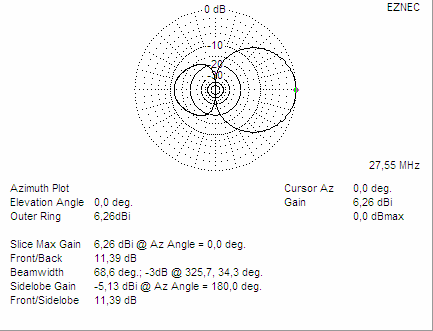 Most yagi's have an impedance of around 20/30 ohms. Your coax cable was 50 ohms, so they don't match. 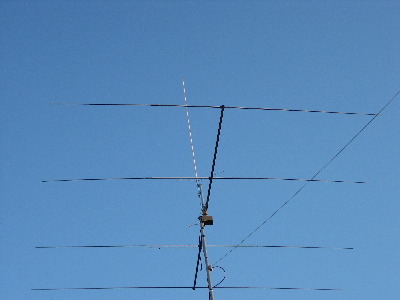 A impedance transformer is put on a yagi the in this case a Gamma match, but there are other types (hair-pin match, omega, t-match) More to this in the chapter connecting the coax to the antenna. The Black line to the left at the above diagram, is called the first DIRECTOR. You can add as many directors as you want. 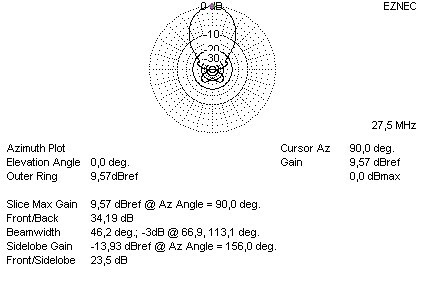 All designs in chapter beams have 1 reflector 1 radiating element and 0 to 8 directors. The most important factor of a yagi is not the number of elements, but the boom length ! The longer the boom the higher the gain ! It has no use to put 9 elements on a 10 meter boom, it is true that a 6 elements on the same boomlenght will produce about the same signal. 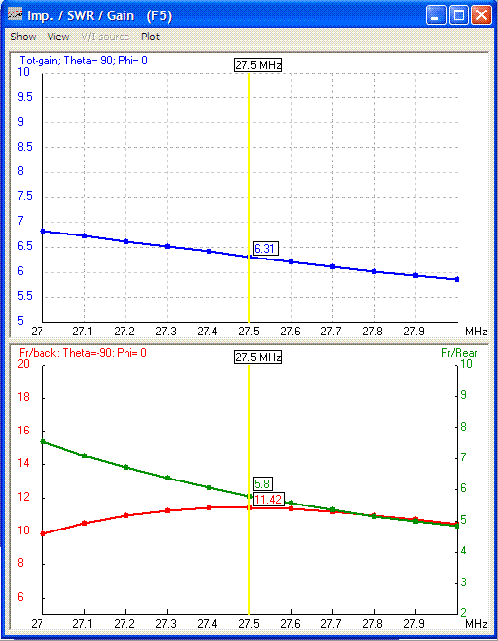 A "standard" rule you can handle for gain, if you want 3 dB's more you need to double the boomlenght! As just described it is true: that with a full size yagi. Say a 3 element with a boomlenght of 4 meter compared to a 4 elements with 4 meters boomlenght. The 4 elements however will often produce a wider bandwidth and front to side ratio's ! The forwarded gain however remains about the same. You will need computer programmers when you want to start modeling Yagi antennas. Free examples are those from MMana or Yagimax. Eznec is for example expensive but when u do use it a lot it is sure worth the effort other programmers like 4nec2 are great but you do need spare time to learn how to use it. Not exactly of course but you get the general idea, the FB and Gain are not at their high values where the SWR is the lowest although many people think this is the case. So please do not worries to much about that SWR. The Gain you might expected from a yagi is shown in a diagram on the page beams. 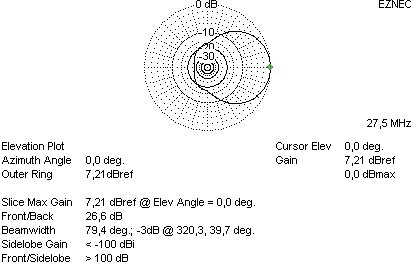 There is no way you might get 21,5dB (as some manufacturers would like you to think) from a 8 element yagi measured the right way! With that diagram you can decide for yourself , which length of boom you need for the wanted Gain. The number of elements on it can be computer assimilated. 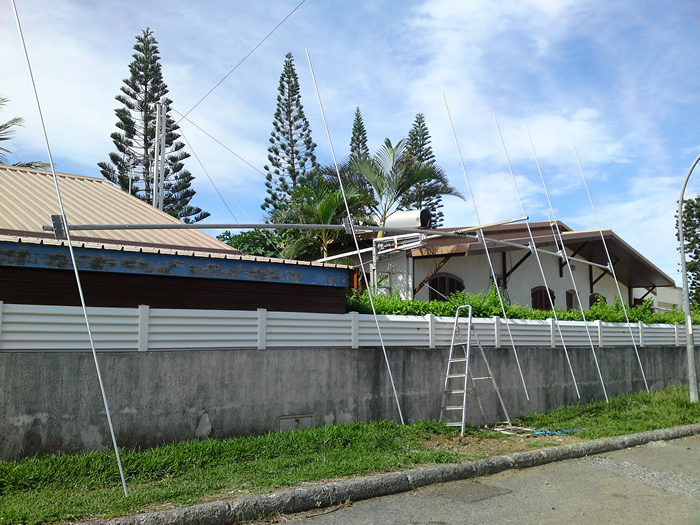 Perhaps you can choose between a small 5 el yagi or a large 4 elements yagi and notice the difference isnt that great. I know guys who have an 7 elements on a 6 meter boom, I would be more pleased with a 5 elements long John with 9 meters boom in this case. All aluminum is suitable for building antennas though the aluminum called : 6061 should have your preference due to it's anti corrosion, and electrical components. Dont forget aluminum exist of iron and copper and some other stuff. The more copper you have the better it radiates but the weaker it gets...again 6061 (T-6) is the one almost all antenna makers use. In the HPSD designs, I have used for all elements 22 mm thickness. This means that the overall thickness of the element will have to be 22 mm it can be that the mid section is 25 mm and the tips end in 20 mm but overall 22 mm. A tapper-computer program can be used to calculate if you are using the right thickness. The two elements yagi-uda is the smallest one among the yagi-uda familly. 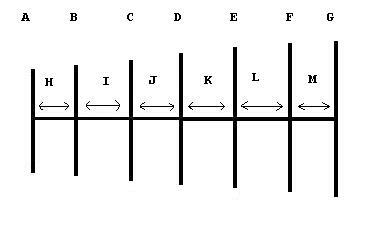 Since gain comes from boomlength. The gain of a 2element is relative low. Some manufacturers might claim they have a “special” feed system or have some other fancy way of putting things. (Like a HB9CV/ZL-special etc.) But sadly, it just isn’t possible to produce more gain on such a boomlength with the described element length. Oke, but is it worth the effort then? 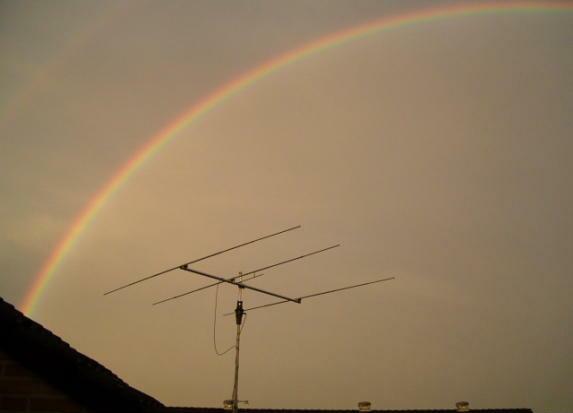 Here comes: THE SECRET PLUS OF HAVING YOUR FIRST YAGI ! Most people, forget there is a thing called “ground gain”. That ground gain only adds gain to horizontal antennas when placed above earth. 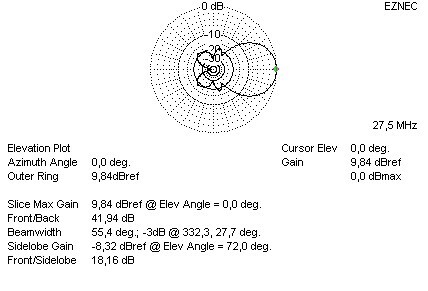 In other words: besides the say 6dBI wich can be expected from a 2 elements yagi there will be a additional approximently 6 dB due to that ground gain.It adds up to about 12 dBI. That is completely different if you would compare that to your halve wave vertical antenna! Please if your thinking about stepping into the beam world for DXing, do try! The traditional 2elements yagi exist out of a radiator and a reflector, but it would also be possible to make a radiator/director version. We could feed both elements and it becomes a so called HB9CV or ZL-special we can bend the elements and it becomes a Moxon. 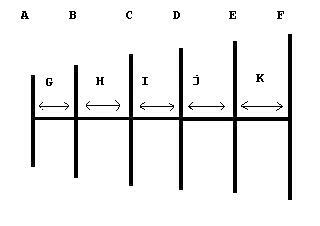 All those individual different 2 elements beams have there own plus and down sides. Described below is a “straight forward” 2elements wich has been used already by many. 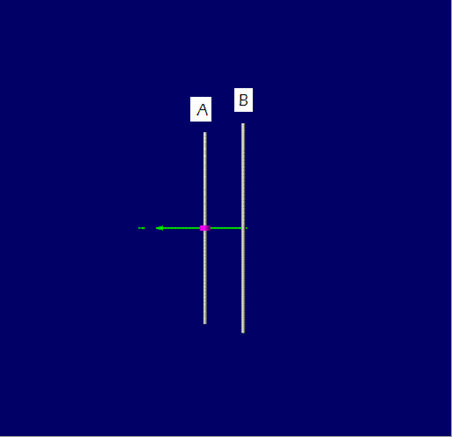 In this case, it consist of only one Reflector (B) and one Radiating element (A). Resonant impedance = 20..25 ohms at 27,6 Mhz. You will need a gamma-match or other matching device to match the antenna. PLEASE CONTACT THE PEOPLE AT INFO@DX-ANTENNAS.COM FOR FUTHER QUESTIONS OR IF YOU NEED OTHER DIAMETERS! DISTANCE, LENGTH ASWELL AS DIAMETERS ARE IMPORTANT! 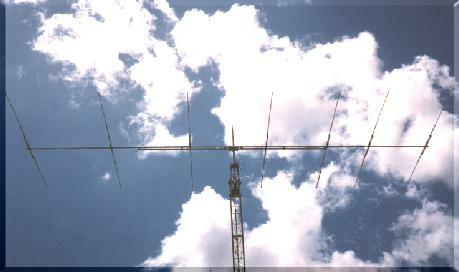 The most common used yagi. it provides great gain and a good F/B with only a boom length we can still handle. 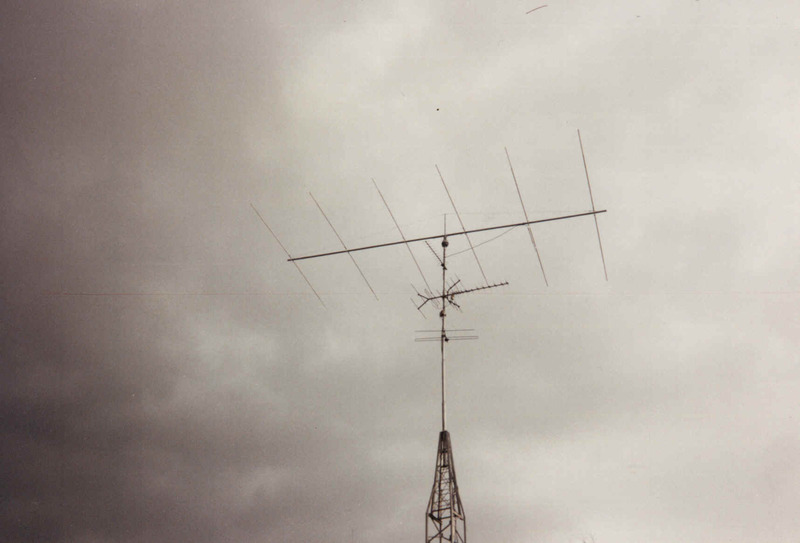 In my early stages of DXing, this was my first DX-antenna which resulted in 60 DXCC....with 4 watt 40 channels in FM ! 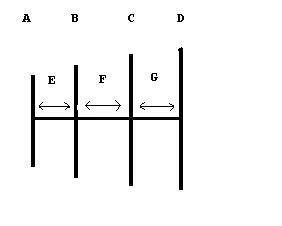 Compared to a dipole the mentioned gain of 6 dB will provide an equivalent from 400 watt on a dipole to 100 watt on the 3 elements yagi. 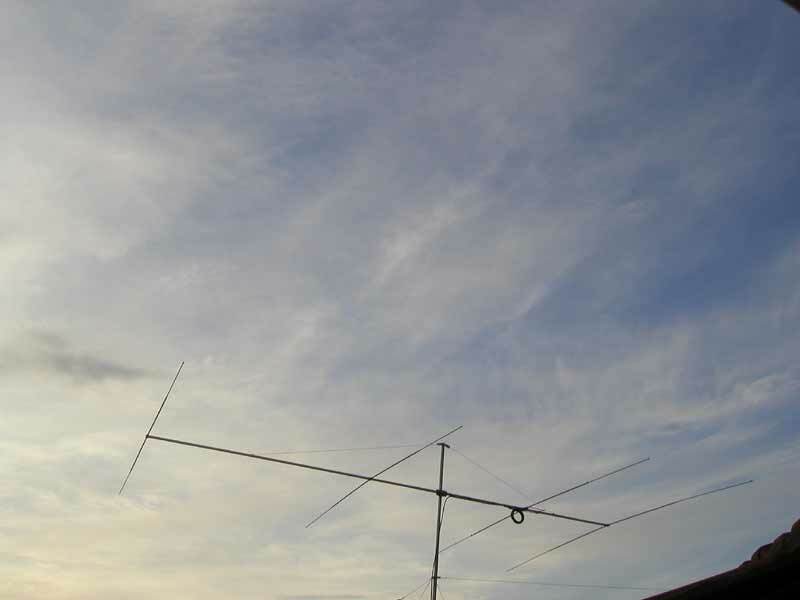 Serious results can be expect when you have a 4 elements Yagi, in most cases all what the Big-guns are working you will be able to hear and work the Dx as well. With the 4 elements yagi we come on a point when we must pay serious effort to our mast and rotating system. Light 4 element can still be used with light rotators like channel master although their life is reduced with extra bearings this again is length. 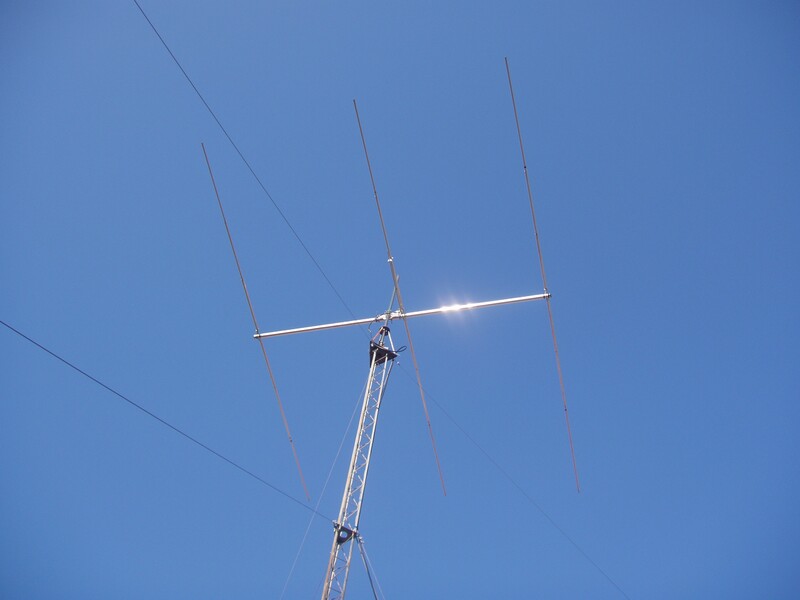 But better is to put a system on your mast like a G600 or an equivalent and a heavy duty 4 elements with this you will have a long lasting solution and one which is able to make some great DX-results. Above mentioned you can see the schematic diagram (not drawn to scale) and the antenna his radiation pattern in the azimuth plane. The serious DXing machine ! These antenna types are worth the effort, the expensive rotator will pay for every penny you have spent. 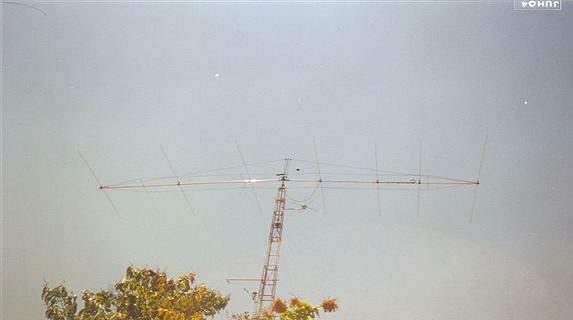 I myself worked 100 DXCC in half a year during the sunspot minimum (2005 sep-2006 feb) with an antenna like this. Rob who has a 5el ITB version has now 298 DXCC great job! They come in a great variation on the market short versions...long versions etc..
As said earlier when you want a significant change with your antenna system this will come down to almost doubling the boomlenght. to much about the mechanical problems. With a boom length in the order of 12 meters for sure, this is not a small gun! On the mast as well as on the rotator a high amount of effort is asked. For the mast you must think in the direction of construction mast (tripod/square), the rotator must be at least an equivalent of a G1000 for long lasting results. 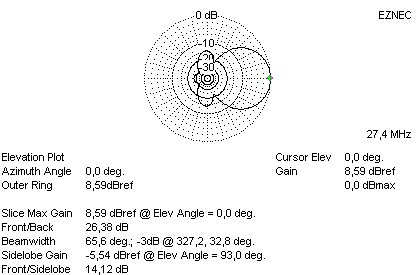 Conclusion: a 6 elements yagi placed high is a BIG GUN! Short version Boomlenght 7,3 meters Types HPSD 6 Short. The first design is actually to short to be called a real 6 elements monobander. You can think of the antenna as an optimized 5 elements. 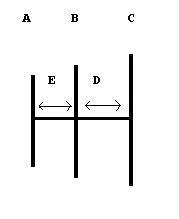 The additional element in front of the Radiating element (J), is responsible for the high FB & FS and wide SWR coverage. 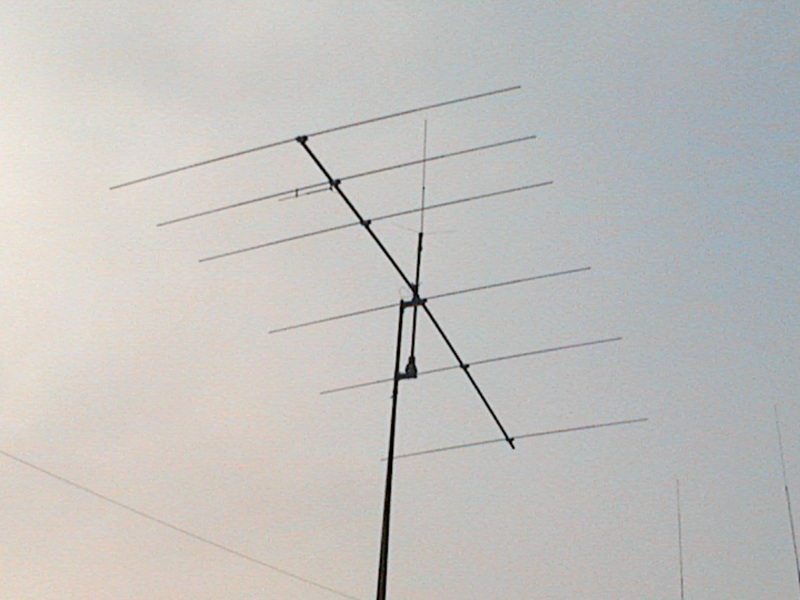 Due to the high FB/ FS and wide SWR this antenna is ideal for stacking. The antenna in the middle is from Bruno 3DX013 although it has a very small boom Bruno confirmed already 256 DXCC with the antenna. When building these antennas don't forget to enforce the boom and perhaps mast. Although this 7 elements is too short to be called a 7 elements, it has some great features for stacking. It has a very wide SWR pattern a high Front to side and the Front to back is also over a wide region available. 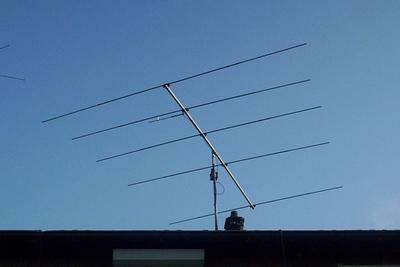 This antenna is ideal for stacking.